Cluster headache is a rare disorder in women, but has a serious impact on the affected woman’s life, especially on family planning. Women with cluster headache who are pregnant need special support, including the expertise of an experienced headache centre, an experienced gynecologist and possibly a teratology information centre. The patient should be seen through all stages of the pregnancy. A detailed briefing about the risks and safety of various treatment options is mandatory. In general, both the number of medications and the dosage should be kept as low as possible. 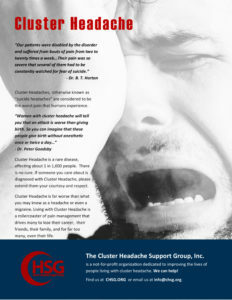 The clinical characteristics of cluster headache in women are very similar to those in men. Women develop the disorder at an earlier age of onset and experience more “migrainous symptoms” with cluster headache, especially vomiting. Both men and women have frequent photophobia and phonophobia with cluster headache attacks. These symptoms are not included in the International Headache Society cluster headache criteria, suggesting the need for possible criteria revision. This paper reviews the diagnostic features of cluster headache-like disorder and describes its presentation in childhood. Case note summaries of patients with this condition are presented in the context of a brief summary of the literature. Four patients (two girls; aged 12 to 15 years) with cluster headache-like disorder were seen over a period of four years in the paediatric neurology department of Birmingham Children’s Hospital.